Everyone knows that it is bad etiquette to bring up politics and religion at a dinner party. Why? Because it increases the likelihood for awkward silence and/or extremely unpleasant disagreements as people express their opinions and personal beliefs. Unfortunately, by keeping silent about one's beliefs, it makes it harder for Atheists to know who believes in magical, invisible, all-knowing, all-powerful beings. And this is why targeted online dating and social networking sites are a godsend! The sites listed on this page hope to make it easier for Atheists, Agnostics & 'Free Thinkers' to find one another online. So, if you are looking for a relationship with someone else who pretty much views religion as a farce, then you are in the right place. Looking for others Atheist, Agnostic and Freethinking singles who actually believe in evolution, science...and reality? Join for free to start meeting other Atheist singles like you. 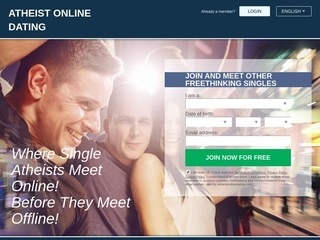 Atheist Passions is a free dating site for atheist and agnostic singles. Join for free and take advantage of photo personals, free email, chat, forums and more. Got religion? You're in the wrong place. 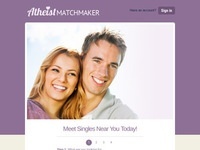 Atheist Matchmaker is for atheist singles looking for friendship, romance and more. If you are interested in meeting other godless heathens, then this is the place for you. Seriously though, it's nice to be on a site where everyone shares the same attitude about religion (or lack thereof). Join for free! Niche dating has exploded online, providing sites that are exclusively focused on one particular group of people (and the people who are interested in that group). If you are interested in the Atheist community, Atheist Dating Connexion is the site for you. It only takes minutes to create a free account, and then you are free to check out the singles who have also been drawn to this site. You can't meet someone just by looking at the homepage, so join...and start having fun! Atheists to the left of me. Atheists to the right of me. If you are looking for an Atheist dating site, then Atheist Personals is worth a look. Sign up for free and search for singles near you. When online dating began to be accepted on the internet, some of the first niche dating sites were religious in nature. Christian dating sites, Jewish dating sites, etc. But for some reason, the Atheists were left out. Well, times have changed. 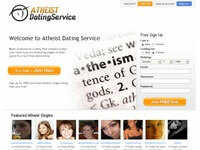 Atheist Dating Service is designed specifically for the 'deity-free'. If you are hoping to avoid religious discussions when you are dating, this is the site for you. It only takes a few minutes to set up a free account, so you can check the site out to see what you think. If you know the difference between being Agnostic and being Atheist (and you identify as Agnostic), then this is the site for you. While it probably isn't a dealbreaker whether someone is Atheist or Agnostic, Agnostic Dating Site is perfect for those seeking other Agnostic singles. Join for free to see if this is the site for you! "Take advantage of the AtheistParents.org forums to talk with atheist parents and singles not only about heathen issues, but also about politics, games, things humorous, and anything else under the sun." Meetup with other local atheists to talk about your beliefs. "Meetup is terrific because it allows atheists of different ages and backgrounds to get together, discuss ideas and issues and get to know one another." "If any of the following describe you...Atheist, Agnostic, Freethinker, Humanist, Non-Religious, Non-Practicing, Objectivist, Skeptic, Pagan, Deist, ...as well as single and looking? Then this site is for you. Browse 1000s of profiles and photos placed by like minded singles."